5 great stories, 5 great authors! Brian James Freeman and Richard Chizmar of Cemetery Dance Publications have teamed up to edit Dark Screams for Hydra (sold through Random House). In this case, 5 authors’ stories were selected by Freeman & Chizmar, and then edited into a wonderful compilation. I love to read…anything! But my favorite genre is “horror”, “supernatural”, “occult”, sci-fy…whatever word you wish to use…to me, they all run together. I was pleased with the beginning story, “Weeds”, a VERY early short story by Stephen King. I read it many, many years ago and it was fun to re-visit Jordy Verrill, a lunkhead who has the usually good luck of having a meteorite land on his property. Of course, this is Stephen King, and Jordy is an idiot. Bad things happen to most idiots in King stories! While the story is actually kind of funny…I still shiver when reading the very gruesome things Jordy experiences. 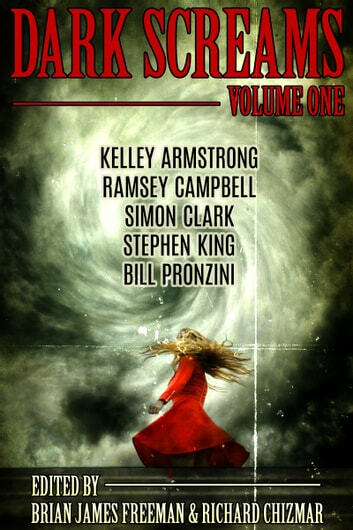 The remaining 4 stories, all written by highly published authors, are new stories and many people interested in this collection will have likely as not, read Weeds (or seen the screen adaptation in the original Creepshow movie in which Stephen King himself, played the part of Jordy Verrill…and a perfect casting it was!) but may not be as familiar with some of these authors but they are good at their craft. “The Price You Pay” by Kelly Armstrong is a great twisting story of how to get away from an old “friend” who is nothing but trouble. Some plans don’t work out the way they are intended. “Magic Eyes” by Bill Pronzini is an awesomely written story that will forever be the benchmark I use to determine if I’ve gone completely nuts! “Murder in Chains” by Simon Clark is something of an even more brutal version of the Hunger Games. Being a short story, he gets right to the brutality and you will flip your virtual pages and be finished before you know what hit you (did HE hit you?). “The Watched” by Ramsey Campbell is the last story and it’s placed there for good reason…Freeman and Chizmar wanted to start you off with a potentially familiar but disturbing story and they wanted you to lay you e-reader down before bed and have trouble sleeping. This, in my opinion, is one of the scariest short stories I’ve ever read. Jimmy, a young boy deals with a (person, ghost, ghoul, all 3?) who seems to live or at least “hang out a great deal” in a bird hide along a canal across from his home. Of course, Jimmy has to walk past this hide quite often and being a kid, is extremely curious. The protagonist gets Jimmy involved in way more than the poor kid bargained for and what he deals with is truly frightening in a relatively nonviolent way which made my skin crawl and my feet come off the floor. Terrific writing by Campbell. For the price of this e-book, you can’t go wrong. It’s an easy evening read (make sure you finish it just before you turn off the lights for a good (or not so good?) night’s sleep)! BTW, I never leave 5 star reviews because so many people don’t read them. I myself typically read only 2, 3 or 4 star reviews but this is easily a 4+!! I throughly enjoyed each and every one of the stories in this collection. They were all very different and each one kept my attention. After reading these stories, I will be sure to read other stories by all these authors. I really had a hard time understanding a couple of the stories. One just sorta ended without a resolution. Dark Screams awaits you at an unbelievable price. Dark Screams Volume One Dark Screams awaits you at an unbelievable price for five ways to ensure a great scare. James Freeman and Richard Chizmar have come together to introduce us to a short but power-packed volume of escalating terror. Who better to start these five stories off than Stephen King? With a touch of The Tommyknockers, and a dash of Invasion of the Body Snatchers, King introduces us to Jordy in his short story Weeds. Jordy is a mentally challenged farmer who believes that the meteor in his backyard will soon become his cash cow. Unfortunately for Jordy, the green that he encounters is not a bankroll, but a intergalactic menace with a very wicked green thumb. 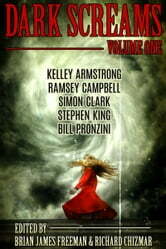 Kelley Armstrong is our next author as we plunge deeper into the abyss of horror with her tale The Price You Pay. The two main characters give friendship a whole new dimension. It is often said that we can never escape our past, but when the past slithers and intertwines around Ingrid and Kara like a giant boa, they are willing to create their own little hell to escape incarceration. It seems you can really hurt the ones you love… or maybe even kill them, at least for Ingrid and Kara. Next up is Bill Pronzini with Magic Eyes. Edward, the main character in this short story, that is sure to catch your eye, is doing time for killing his wife. It seems Edward truly believes that the eyes are a window to one’s soul… or maybe a window to something much more threatening and other worldly. Join Pronzini as he takes us on a rollercoaster ride into the mind of a paranoid, unrelenting killer. Simon Clark invites us underground with Murder in Chains. Clark takes us to a hideaway that is reminiscent of Dante’s inferno. The true mastermind in this tale remains a mystery. John York, the main pawn in the snare of gore and torture is in for one hell of a ride. As John tries to be a knight in shining armor for a damsel in distress, he finds himself in a series of life menacing games. Clark shows us that games may not always have victors. Sometimes games are just for fun! Lastly on the list of grizzly delights, we meet Jimmy in The Watched. Ramsey Campbell shares new insights on what it might be like living with grandma. Jimmy is recruited to spy on his neighbors by a community policeman. Suspecting the worst about his neighbors and the intimidating policeman, Jimmy worries about his and his grandmother’s safety. Fear permeates this short story, and eases into the mind of the reader like a spider motionless in its web waiting for anticipated prey. Jimmy becomes a part of something more sinister that he could ever dream. Bravo! Freeman and Chizman of Cemetery Dance Publication. I’ll be shivering with fear and anticipation for Dark Screams Volume Two.